Kidznsnow :: Utah's Terrain Parks offer skiing and snowboarding families fun in the snow. From The Canyons to Snowbird to Park City, Utah's got lots of activity on the slopes. Forget about a walk in the park. How about a huck, jump, or jib in the park? Appealing to adventurers of all ages, Utah resorts have followed a nationwide trend by offering terrain parks for both skiers and riders. The parks allow entire families to enjoy banks and jumps together, and one more way to have fun on a beautiful Utah winter day. Brian Head Resort is expanding its terrain park offering for the 2003-04 season to offer four parks of varying ability levels. The parks will offer more than 30 snow features, rails, boxes and a half pipe. Tools and benches at the top of lifts, a wide assortment of freeriding terrain, and an unpretentious, playful vibe round out the resort's freestyle terrain park offerings. Brian Head is also offering new terrain park clinics this season, for skiers and riders ages 8 to 17. At Brighton, three interconnecting terrain parks make it possible for winter sports enthusiasts to ski or ride hips and tabletops all the way from the top of the Crest chair to the bottom of the mountain. The parks feature over three dozen jibs and rails, and numerous table tops, hips and jumps. Brighton's terrain park complex was voted Best Snowboard run by Salt Lake City locals in the City Weekly Readers choice awards. Brighton staffers say they'll be adding more jibs, rails and boxes for this season, as well as "a few surprises." For years, The Canyons Resort has been known for its commitment to snowboarding, freeskiing and to building award-winning terrain parks. The 2003-04 Season is no exception. The Canyons terrain park is in a new location, accessed off of Snow Canyon Express. The park's elevation is 1,600 feet higher than the previous location. This will provide more consistent natural snow coverage throughout the season. Skiers and riders can choose from nearly 30 features throughout the park, including rails, boxes and jibs. There are designated runs for both beginners and more advanced skiers and riders. The Canyons Resort also features seven natural halfpipes throughout the resort, including the winding and challenging mile-long Canis Lupis. The Canyons Resort has been ranked in the top ten terrain parks in the nation by Transworld Snowboarding magazine. Deer Valley Resort boasts Utah's only public Skier Cross course, located on the Ore Cart run in the resort's Empire Canyon area. The Skier Cross is a slalom course with character and interesting features such as large banked turns, jumps and rolls. It's different from a terrain park in that it's a timed course, from top to bottom. The course was designed by an FIS (International Ski Federation) technical delegate. It's a pro-level, single-track course, where enthusiasts compete only against their own times, and not other skiers. Deer Valley's Ski School has been using the Skier Cross course frequently for intermediate and above-level classes, particularly the youth Adventure groups ages 8 to 12. Deer Valley's Skier Cross course is open seven days a week, from 10 a.m. to 3 p.m. The cost is $3 per run, and tickets can be purchased at the race course start in the timing building. Skiers do need to sign a release before entering the Skier Cross for the first time. Park City Mountain Resort is one of only three resorts in the world with top terrain parks recognized by both Snowboarder Magazine and Transworld Snowboarding Magazine. This season Park City Mountain Resort continues to expand its commitment to the Snowboarding and FreeSkiing initiatives by adding eight new rail and funbox features to the already existing 35 rails and signature All-star rails and 18 jump features. With three terrain parks and two pipes to choose from, including the Eagle Superpipe that hosted several 2002 Olympic competitions, there is surely something for everyone. Keep your eyes open for the Park City All-Star snowboarders in the terrain parks. The resort has also named a new Park City All-Star Skiers team to include Tanner Hall, reigning World Superpipe Championships winner, Pep Fujas, and John Symms. Powder Mountain has a terrain park with one table top, four rails and a quarterpipe, located on the Confidence run, which is lit at night. They also have a halfpipe on the Hidden Lake side of the mountain. Snowbasin also has a terrain park product for this season, offering an array of rails, boxes, c-rails, jump and tabletops. Snowbird's three terrain parks offer a playground for jibbers and huckers of every skill level. For those just starting out, the Witch's Ditch banked turns, rollers, and beginner halfpipe will help anyone who wants to begin park riding, from the littlest rider to the youngest at heart. The intermediate Terrain Park, located on Big Emma near the improved halfpipe, helps park riders continue to improve their skills with a series of rails and hits. Advanced park riders challenge themselves in the Baby Thunder Terrain Park, where a series of more difficult hits, kickers, tabletops, spines, jumps, and rails of every shape and size are found on nearly every trail in the Baby Thunder area located on the western edge of the resort. For those desiring to hone their park riding skills, Snowbird's nationally recognized Mountain School offers both private lessons and affordable group lessons that focus on park skills, including terrain features and the pipe. Solitude has a new "family-friendly" terrain park, built with fun in mind for everyone. The goal of the park is to have an area where everyone feels welcome, young and old, first time or a veteran, whether on a snowboard or skis. Most of the features are snow based (no steel structures) and are a manageable size for all riders. Another unique feature is a sitting area for families to take a break from the action. The park is located in gentle terrain and will be accessible from four of Solitude's eight lifts. 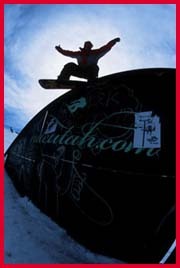 For more information on Utah resort terrain parks, call Ski Utah at (800)754-8824 or visit skiutah.com . For more information on Park City resort terrain parks, visit parkcityinfo.com.